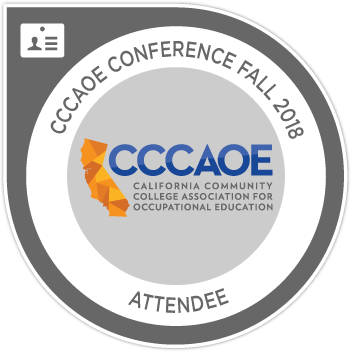 Earners of this badge attended the CCCAOE Fall 2018 Conference "Career Education: Leading Change". These candidates attended more than 70% of the conference sessions. The CCCAOE Conference provides leadership development on issues related to budget and finance; innovation and student learning; leadership; equity adequacy, and opportunity; community engagement, communication or collaboration. This premier event focuses on key areas to guide teams through tough fiscal times. Attend more than 70% of the CCCAOE Fall 2018 Sessions. Sessions include: General Sessions, Panel Discussions, Break-Out Sessions, and Faculty Listening Sessions.